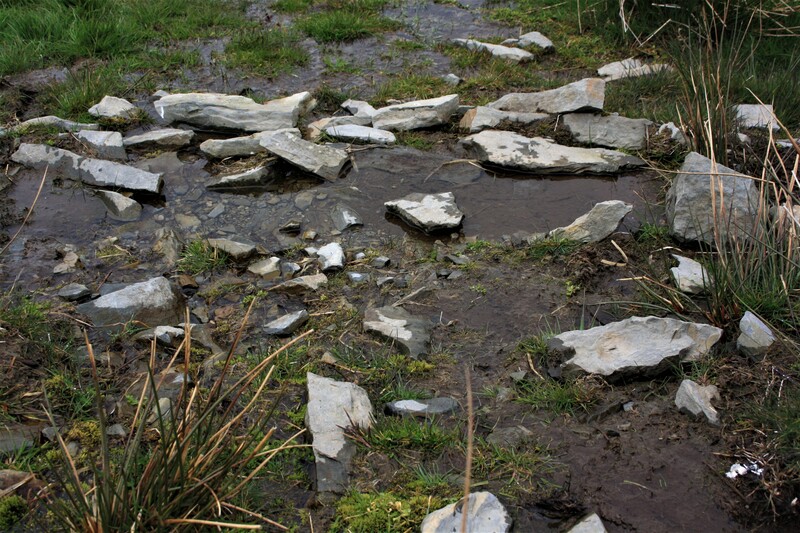 I have just finished reading Tristan Gray Hulse’s fascinating in depth study of Ffynnon Lleinw near Cilcain, Flintshire which has been serialised over the last few months in the In Search of Holy Wells and Healing Wells blog . In his appendix he makes reference to a 1944 book by Glenys Wynne on the history of Cilcain. I haven’t managed to find a copy, but he quotes a passage referring to other Cilcain wells which includes Ffynnon y Gweithiwr – the workman’s well. That was sufficient to get me clambering up Flintshire hillsides on a gloomy, drizzly April afternoon in search of the well. The well is marked on the older OS maps, we find it on the northern slopes of Moel Llys-y-Coed some 400 metres above sea level maybe half a mile to the north west of Cilcain. It lies beside a footpath which leads from Cilcain to Moel Arthur, a nearby hill topped with a hillfort. The maps show mine levels and a the tracks of an old tramway on the southern side of Moel Arthur. Apparently this represents the remains of exploration for gold in the nineteenth century, crushing and washing machinery was installed on site at the time although nothing remains today. One can only wonder if the workmen after whom the well is named were employed at this site. All I can say is, that the children would have to have been fairly fit in the first place to climb up to the well from Cilcain, the exertion alone might have shifted any complaints that they might have had. As for picnicing, in better weather it would have been an ideal spot – the well is set at the top of a small depression in the hillside, west facing, it would have been warm and sheltered on a nice day – today it was damp and slightly miserable.